One of my favorites to visit! Where we live, Food Trucks are somewhat still a novelty. They’re downtown and in places like Clayton, where there are a lot of offices, but here in the burbs, the closest thing you’ll find to a food truck is the ice cream man. Not really a good comparison. Over the past few years, local municipalities have started having events that feature these restaurants on wheels. During our weekday evening run at Creve Coeur Park last summer, we discovered how great these little events are. The first time, we couldn’t figure out why the parking lot at Sailboat Cove was full and we had to park in a small side lot. The event, Feast in the Park, is held at various parks in St. Louis County and features a local band and about 10 – 12 area food trucks. The aroma alone was enough to get us to pick up our pace on the four-mile loop around the lake. We learned then that if you want the good stuff, you need to get there early because once they run out, they’re done. Especially the cupcake truck. Yep, learned that the hard way. This past Wednesday, armed with all this knowledge and experience, we ran in the morning instead and just went for the gorge-fest. We couldn’t have asked for better weather, the band played at a volume that one could enjoy without having to scream over, and the food was divine. We took the girls and met up with a group of friends to enjoy the gorgeous evening. Luckily our friends had more foresight than we did and brought some chairs (we only had a blanket and an old towel). They also packed drinks in coolers, something I definitely recommend whether you’re drinking water or Chambourcin. Sitting there on our blanket, laughing with friends and family, we could have been a cover photo for Perfect Summer Evening magazine (if there were such a publication). One of my favorite things about the food truck events are the variety. From Italian to Greek to plain ‘ole burgers and fried chicken strips, everybody can get what they want. It’s a little like a more charming version of a food court at the mall with much better character. I’m disappointed that it took me this long into the summer to discover the fun of these free concerts in the park. But better late than never as the saying goes. If you’re in the St. Louis Metro area, check out one of these evenings on the flyer on the above link, while you can, before summer gives way to another fall and its jam-packed schedules. I found that Florissant has “Florissant Food Truck Knights” at their Knights of Columbus on St. Francois on August 22 and October 10th from 5 pm – 8 pm. And I definitely want to recommend my hometown of O’Fallon, Missouri’s “Food Truck Frenzy” on August 16th at Ft. Zumwalt Park. Look how young we were! Could be written in a book. When the seat next to me you took. Would lead to wedding flowers? In a summer plagued by flooding rain. With a reception party quite insane. Seem so long past I can hardly remember. Emily and Erin, our final family members. Would be such an awesome Dad. With the wild tube rides that they take. In times of sickness and in health. But of laughter and love we’ve much wealth. Throughout each mood and phase. I’m the person that you chose. And my love each day for you still grows. Thank you for making these past 25 years amazing! In case you missed me last week (I kinda hope SOMEONE out there did), I was on vacation with my family at Table Rock Lake. My husband, Darrell, tells his boss he pays extra to NOT have phone/WiFi access while we’re there just so he gets some peace and quiet, but it does make it hard to do anything online. One day I got out the computer to write overlooking the beautiful view, but in addition to my laptop having technical difficulties, I found myself not wanting to miss out on precious time with our family. So I put it away. However, I did enjoy some wonderful time thinking of more things I wanted to explore in my writing, so I didn’t actually “lose” a week writing. 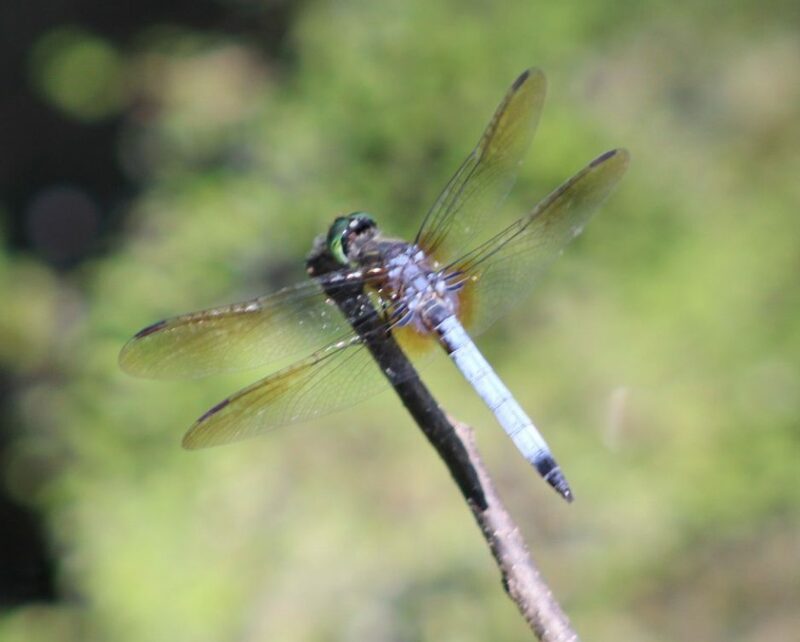 For one thing, my father-in-law, Mike, got some dragonfly pictures for me when we were out on the boat. So I swapped out the blog’s graphic. (Thanks, Dad) These are the gorgeous little creatures we always see out there at Point 15, near the St. James River. It’s kind of the end of the Lake, so it’s usually pretty quiet during the week with only a few other boaters. If we are ever able to have a vacation home, there are several in that little area in Cape Fair I would love to take off someone’s hands. Of course, that might be a loooong while—another thing we did on vacation was visit a college with Tyler (blog post forthcoming on that) Having three kids going through college in the next ten years will most likely preclude any second home purchases in the near future—as if that’s the only reason! Since we can’t afford to buy a house there, we did buy an island this year…and yes, it does fold up nicely on a shelf in the garage. I am happy to report that I was able to get plenty of reading in while on vacation. Time spent reading is such a gift to me. So often I feel that I need to be writing, writing, writing, that I don’t balance it with reading very well. We also got in a lot of boat time—tube rides, water skiing, knee boarding and swimming. If you look really close at the picture in the big splash you’ll see me falling off the tube as the girls look on. Sympathetically, right? The most important thing about our vacation is the time our family spends together. It’s a nice surprise to have your seventeen-year-old son post a photo collage on Facebook saying he’s having a great time with his family. Our kids loving seeing their younger cousins, and just hanging out with their grandparents and aunt and uncle they don’t see as much as we’d all like. As a married couple, we’ve gone on this vacation annually for over 20 years, but Darrell’s family has been coming out here longer than that. Over the years, our once large group has gotten a bit smaller, but the lake vacation is a tradition our kids look forward to each and every year. Even if it’s the five of us sharing one tiny bathroom. Talk about your family bonding. Congrats Erin for taking 3rd in the 14 and under category for the Firecracker Run 10K! Seventeen years ago I was a first time Mom that had gone from working full-time down to part-time. Not that I couldn’t keep myself busy with just that, but I craved being around other adults outside of work. I can’t remember exactly how we began, but a small group at church started a Book Club and being that a nice, hot meal seemed rare for me with a new baby at home and I enjoyed a good book, I joined it. We took turns meeting at each other’s homes and in the beginning, our Associate Pastor informally led our discussions about books we selected from Oprah’s Book Club list. While I love discussing a good book (or even a bad one) and our meals are phenomenal, what I get most out of Book Club is the wonderful friendships that have been forged. Even though most of the people I’ve gone to church with since I was a little girl, I didn’t really know them except by name. In the beginning, my friend, Kristin and I looked forward to a night where we could leave our babies, just months apart in age, at home with our husbands. Believe it or not, although we are distant cousins (I think our dads were second cousins), before Book Club I only knew Kristin casually—as in we’d wave if we saw each other. Through the years, both of us had two more daughters just months apart who have grown up together and are very close. Had I not joined Book Club it’s possible that I may have gotten to know her eventually because of our kids, but being in Book Club together was what really connected us initially. If you saw a picture of our little group, you may be inclined to think we’re some nice little church ladies sipping tea and exchanging casserole recipes. (We do exchange recipes, but generally we sip wine.) In fact, one time long ago, a few of us went to the wrong apartment when our Associate Pastor who lived in the City was hosting Book Club. We went up to his neighbor’s apartment thinking it was Pastor Kirk’s address and knocked on the door. The guy who opened the door was probably early 20s and I think his jaw dropped to see the four of us standing there with our cozy little casserole dishes all wrapped up with books tucked under our arms. I think he was a little disappointed we weren’t coming to serve him some dinner! Needless to say, we weren’t a very intimidating bunch standing on that front stoop, but you’d be surprised to find that, though we might fit the image of a stereotypical ladies’ church group, we are actually very diverse. We have a great mix of political views, types of favorite book genres and opinions. We have been full-time career women, stay-at-home Moms, world travelers and have grown up in different generations in different parts of the area. Our discussions are fantastic—about church, books and life in general. As you can imagine in seventeen years, several of the people in our Book Club have come and gone. A few have retired or moved away, and sadly, some have lost spouses or passed away themselves. While we do occasionally still read an Oprah pick (we just discussed Sue Monk Kidd’s The Invention of Wings), we now read all sorts of books. One of my favorites, ironically about a Book Club, was Lorna Landvik’s Angry Housewives Eating Bon Bons. But what hasn’t changed in Book Club is the safe forum we’ve created for discussions with respect for our differences. Oh, and the food is still wonderful. Whether they realize it or not, these women have given me so much through the years. We’ve shared a lot of laughter—a time when one of my dogs was licking Pastor’s toes through his sandals while he was saying grace before dinner comes to mind—and we’ve shared in riding out the storm during times of transition at our church. We’ve celebrated births and grieved together over the loss of loved ones. I’ve collected many recipes and found new authors I’ve come to love. I expected Book Club to deepen my love of reading; but never would have thought that something as simple as a little Book Club could strengthen my love for my faith community. And that’s almost as good as having three desserts.